It was a long and harsh winter for the people, in the village. For many long months, the villagers sat in front of their small fires, in their small little homes, trying to stay warm. The neighbors became strangers, as they watched their food supplies dwindle, their hunger grow. One day, a traveler arrived. On his back, he carried a very large pot. The traveler was hungry but the villagers would not help him. They did not have enough to feed themselves, they yelled. They immediately locked their doors and hid from him. So, the traveler sat in the middle of the village square, stomach rumbling and he thought. Then he started roaming around, as if searching. The villagers grew curious, as they watched him. He jumped up, as if excited. In his hand, he held a smooth and round stone. Hurriedly, he built a large fire and upon it, he placed his large pot. Happily, he filled this pot full of clean fresh snow. He then reverently placed his stone in the pot of now simmering water. The villagers slowly crept out of their small homes towards the traveler. One of the villagers asked “What are you doing?” To which the traveler replied “I am making stone soup, which is the most wonderful, rich and filling soup ever made.” The villagers all murmured at this reply. After a little while, the traveler took a small spoon and tasted his soup. “Ahh, ” he said…”How wonderful this soup tastes already, although it needs just a little garnish to improve its flavor. How unfortunate this soup, will not be perfect, as I have none.” One villager, upon hearing this, offered a few onions, he had been saving. The traveler cut it up and threw it into the pot. The villagers watched again, as the traveler tasted the soup. The traveler remarked how the flavor of the soup improved but alas was still not perfect. Another villager offered some carrots, while another offered celery. The scent of the soup started to rise from the pot, filling the village with its wonderful smell. More and more villagers, now excited about the soup, started offering other ingredients and herbs, to make the soup perfect. In when some meat, then some potatoes, then herbs and vegetables, of all sorts. The bubbling soup smelled incredible! Finally, the traveler took a final taste of the stone soup. The villagers, all were quiet with anticipation. The traveler, after a pause, declared “The soup is perfect! Come and bring your bowls and spoons and share this Stone Soup with me.” So, everyone, villagers and the traveler, ate the filling and hearty Stone Soup, until they could eat no more. Whenever I make soup, I think back to this story. It is an old folks story about how a stranger persuaded the local villagers to give him food. It ends up teaching a lesson about cooperation especially when there is scarcity. This is another one of my most favorite stories. I love how a big pot of stew or soup can bring people together. I love how comforting and filling a soup can be..especially when you are cold, hungry, tired and sick. It’s probably one of my favorite foods to make and can be varied in so many ways. This is the recipe to a very simple chicken noodle soup. Hope you like it. Place all ingredients and about 1 teaspoon of salt and pepper each in a large stock pot. Fill pot with enough water to covered all ingredients. Place pot on stove and simmer for about 2-3 hours, or until you can slip the chicken meat off the bone. Carefully remove chicken from pot and remove meat from bones (discard bones and skin etc). Shred meat (I added only dark meat to the pot but if you wish to use the breast meat, do not add it to the soup, yet) and add to pot. From here, you can let the soup cool and then refrigerate, so that you can easily remove the fat from the top of the soup or you can carefully skim off the fat, from the top of the soup. When you are ready to serve, bring soup to a rolling boil and add noodles. I love that story, I used to read it to my preschool classes! 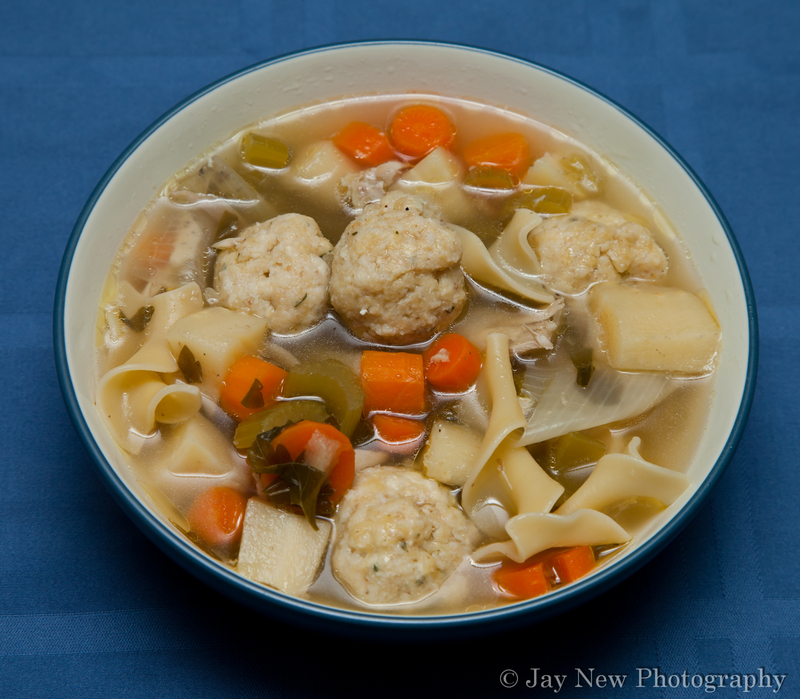 Great recipe, I always try to make my wife chicken soup when she’s sick and she always declines. Maybe I’ll tell her I’m making her stone soup next time. Or maybe I’ll tell her I have a new recipe! Girl who you telling.. it was not a picnic winter here lol. But I really like the gluten free suggestion and I love the recipe itself. I see you added in the matzo balls which are a great touch. Nice job as always Samina. Thanks Kay 🙂 lol the gluten free suggestion…well I didn’t want people to not make the soup just because of the noodles lol. Try it with 1/2 bunch dill… fabulous flavor from the dill. I know what you mean 🙂 I couldn’t find any “good looking” dill, when I was shopping, so I skipped it in this batch. Hi Mommy! I am firmly in favor of this soup. Do you cook the chicken first?